If canceled or modified within 48 hours before date of arrival or in case of no-show, 100 percent of the first two nights will be charged. Factory House is a boutique hostel designed for a small number of guests, which is perfect for travellers who value a personal and homely environment. 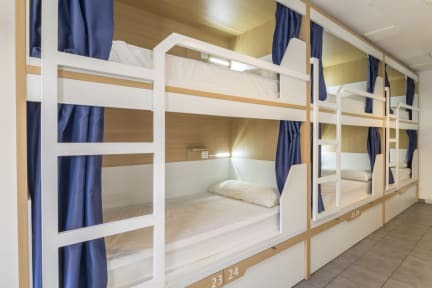 Factory House hostel aims to offer a high-quality service, what starts in the dorms, with our personally designed bunk beds with curtain that provide privacy whenever our customers want. Each bed has an individual light, a power plug and a spacious locker. Heater and air conditioning is also provided for free in all our dorms. Our communal areas are where everybody can socialize in the hostel. In our full equipped kitchen there is always people cooking and sharing experiences of Barcelona with others. Check out until 12 p.m., no hurries when you stay at Factory House hostel. All members of our local staff are delighted to advise our guests on itineraries, transport, restaurants, parties and anything else they might require. Nice to have the possibility to close the curtains and have some privacy. 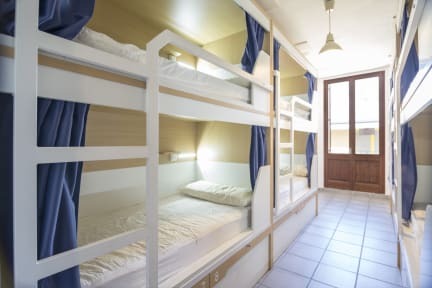 Wij verbleven in deze hostel om een vriendin te bezoeken die achter de hoek woont, dus voor ons was de locatie zeker oké. Het is wel een pittige hoogte die je dien te beklimmen met je koffers vooraleer je de hostel bereikt. Inchecken & uitchecken gaan heel eenvoudig, het personeel is erg flexibel & vriendelijk. Zo mochten we na middernacht nog inchecken. De kamer zelf was niet erg proper. Zo lagen er op het bed heel wat haren en ander vuil. Ook was er een beginnende schimmelvlek in de badkamer.